Not here to defend Kiprop, but did you even watch the race? Pretty sure O’Hare was shaking his head because he blew up and had a bad race after being in contention with 200 to go (he led the first 3 laps). He finished way down the field. You might just be surprised who lurks here. RE: Asbel Kiprop publishes videos of him making out with his pacemaker's wife as he thinks pacemaker set him up for EPO bust 8/28/2018 8:11PM - in reply to Yikes! I feel bad for .... Asbel. I don't feel bad. He's an adult. He made his own bed. What ever happened to integrity and personal responsibility? He went down this path on his own. What's his clean mile time? I think it's close to what he ran in Rio. He's a 4:02 miler. Isn't it ironic that more details come out about Crazy Kiprop the same week the Brojos want us to fawn over an article on a supposed "clean" mile training group in Kenya? I'd say there are enough Positive Drug Results from Kenya the past few years, to cast doubt on the whole county. Now there's an accredited drugs testing lab in E. Africa? I recall someone posting to write Ethiopia and Kenyan federations to ask them to do this, to do better, etc., and provided the publicly available contact information -- only to have the drug justice warriors that run this site...delete that thread. Why would we get anything out of that article, while we would have in the back of our minds the wonder of which ones are on drugs, waiting for them to test positive?? RE: Asbel Kiprop publishes videos of him making out with his pacemaker's wife as he thinks pacemaker set him up for EPO bust 8/28/2018 10:16PM - in reply to He'll MKGA. I want that as a poster, hashtag Make Kenya Great Again hashtag Make America Great Again. Are you suggesting that all or most nations are involved in paying bribes to the IAAF/local federations or just the E. African nations? If other nations are involved, especially first world nations, I don't see how any whistleblowers haven't come forward. Consider that it didn't long for a few whistleblowers to come crawling out of a hole and blow the lid on Russia, both with Athletics & the debacle at Sochi. I don't think people can keep these things secret very long - there's too much money to be made in writing books & making movies on it. As crazy as this thread is, just perusing now, people need to understand that this behaviour Kiprop is showing is fairly predictable. Many drug cheats or other people caught being fraudulent in their respective fields who lose everything go into a destructive mode like this. It's fairly common. People just need to look away and not give him the attention he wants. He's done. Forget about him. Athletics Kenya Diaspora County added a new photo to the album: WE NEED TO HELP OUR BROTHER KIPROP — in Eldoret. A love triangle involving former 1500M champion Asbel Kiprop has left a woman fighting for her life, a broken marriage and shattered reputations. Nancy Rotich, 24 who is married to athlete Andrew Chepsiya, Asbel’s training partner and pace maker attempted to commit suicide by swallowing pesticide at her house in Kuinet, Eldoret a few hours after Kiprop leaked a video showing them in a compromising situation. In what reads like scenes from a tragic romantic drama, Asbel also called the woman’s husband on Sunday night, and confessed that they have been having an affair since 2016. The athlete said he did all this to exorcise the ghosts of his diminishing career that has seen him fight doping allegations and a series of other misfortunes. He blamed his secret lover for all his troubles, including a widely published case last year when he knocked down a pedestrian at Kapseret, on his way from the Moi International Airport, Eldoret airport to pick her for one of their clandestine activities. “I am coming out clean to expose this woman who is like a bad omen to my career. Her entry into my life saw good fortunes fly out away and the negatives have been like a shadow to me,” the former 1500M champion said on phone. “I called Chepsiya at 7.30pm to confess my relationship with his wife before I posted the video and photos on my Facebook page,” Kiprop said. Kiprop also claimed that he made a similar confession to his wife, Sammary Cherotich, before all hell broke loose, forcing him to storm out of their house, before going to an undisclosed location in town from where he posted the video and photos. "I posted the video at around mid-night," he said. The video, which went viral shows the athlete in his vehicle kissing the woman in a denim unbuttoned blouse as they enjoy Kalenjin music blaring from the car loudspeakers. The Standard tracked down the jilted husband who explained that the athlete called him between 7.30 and 8.00 pm on Sunday to confess that he has been in a relationship with his wife. The call triggered an altercation between the couple, culminating into a decision by the wife to walk out. “She wanted to leave during the night but I told her to spend the night then leave in the morning. That is when she took the pesticide in an attempt to commit suicide,” Chepsiya said. “I rushed her to hospital after my brother and I discovered that she was unconscious in bed after packing her clothes, we saw an opened packet of pesticide which we suspect she had swallowed,” he said. “I paid Sh10,000 as a deposit for her to be taken into the facility after we drove her in from home,” Chespiya said. The pace maker explained that the lengthy call from Asbel opened a Pandora’s Box on the numerous affairs she had with other athletes and politicians. "Nancy owned up to having been involved in numerous affairs and we agreed to amicably split as our marriage was broken irreparably," he said. Chepsiya revealed that he had gotten wind of the affair a while back but the revelation came as a shocker to him. He is angry at Kiprop for his betrayal. The athlete recalls of a day Kiprop called him to have refreshments at a local joint near the Moi University School of Law Annex in Eldoret which turned out to be a move to divert him from knowing Kiprop’s intent. “He is worse than a murderer, the things he has done behind my back yet he is my friend and fellow athlete has really gone beyond what an enemy would do,” he said. Chepsiya explained that he and Kiprop were very close that he had lent the athlete Sh 500, 000 to settle the Kapseret accident matter with the family of the deceased woman. A source who spoke on condition of anonymity at the Eldoret Hospital where Nancy is admitted said that she is in stable condition. “The patient was brought into the facility some minutes past 1am by a person who identified himself as her husband. She is admitted in the female ward and she is in stable condition after ingesting some pesticide,” he said. 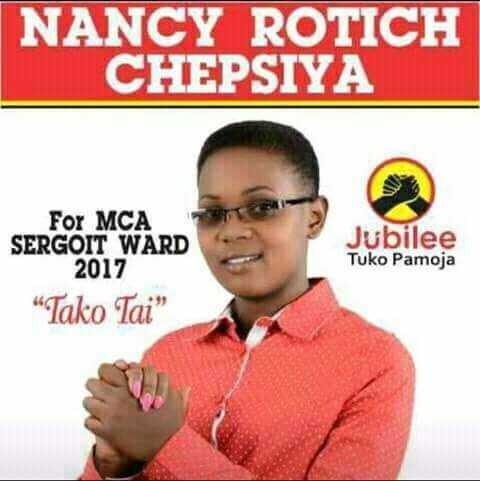 Nancy, a business lady turned politician unsuccessfully vied for a Member of County Assembly for Kuinet in the last general elections. did this article say that Asbel and Nancy struck and killed a pedestrian? kiprop was in a car accident in 2013 and almost died, but i did not know about this! but but but kenyans are such good christians, dont even take asprin.....kill people!?!?! drinking to oblivion!?!? TAKING EPO!?!? these are lies and fallacies , i bett your racists will say anything to tarnish this wonderful running nation! “Nancy owned up to having been involved in numerous affairs and we agreed to amicably split as our marriage was broken irreparably," he said. Asbel and Nancy are an accurate representation of 45 million Kenyans. Your intelligence never fails to shine through, mindweak. Asbel and Nancy is starting to sound a lot like Sid and Nancy. Did he really kill a pedestrian on his way to bonk his friend’s wife, after calling his friend to determine his location? Yet he blames the woman for everything! He tells his friend to meet him for drinks on one side of town, but it's a ruse to so he can bang the friend's wife on the other side of town. Than he hits a pedestrian and kills her while driving to the rendezvous. Than he gets his friend/pacesetter/cuckold to pay off the dead woman's family. He’s gone to having the world at his feet to losing his family and career. Of course he can’t handle it. Interesting his performances started to decline in 2016 when the affair started. Nancy unsuccessfully ran for office for a ward in the local county council elections. Hang on! Maybe I’ve missed something, but my reading of this thread and other links is that most of what we have is based on ‘whispers’ and alleged reasons. We know that Kiprop is a list and self destructive, so that means we should take his alleged actions being the result of his pacesetter ‘allegedly’ informing the IAAF that he was doping, with a huge pinch of salt. Nothing is confirmed. The pacesetter hasn’t admitted to doing this. It is just as likely that the IAAF have had their own suspicions about Kiprop, and that he was caught by random testing alone. I think we need to wait until proper evidence or proof emerges as to exactly how he was caught. The main thing for now is that he has been caught, he is no longer competing and cheating others out of their success, and that the IAAF continue to test (through the AIU) all athletes to the same robust levels. 1) Canova has admitted there is a doping problem in Kenya. "all these drug busts" are still too few to say "massive doping culture". 2) He said that EPO can work on Kenyans, but not when they are already trained at altitude. He later expanded this to include athletes like Moen. 3) I do not limit my opinions to just Kenyans. In fact my main take away in the performance thread -- what it was all about -- was looking for evidence of a large EPO effect in non-Africans, who have consistently lacked the performances of the small regions of North and East Africa.